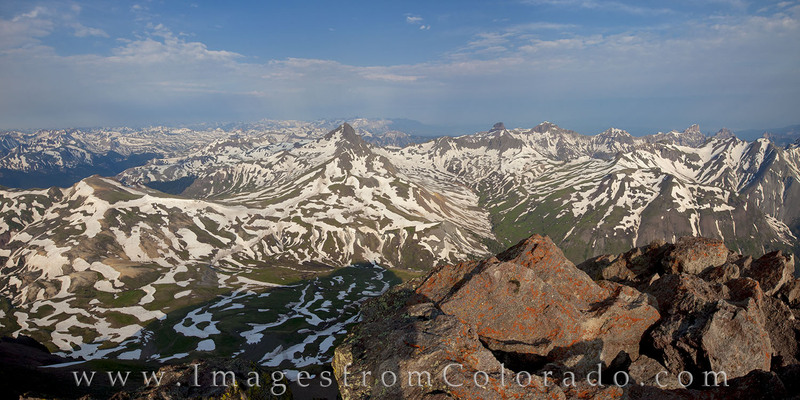 From the summit of Uncompahgre Peak at 14,309’ near Lake City, this view shows the surrounding 13ers, along with Wetterhorn Peak in the distance. We arose about 3:15am to make it to the summer just after sunrise. The weather cooperated, and we were treated to one of the great views of the San Juan Mountains. This panorama from the San Juans is available in larger and custom sizes. Please contact me for more information.